So if you have ever wondered how to make raspberry sorbet, this recipe for easy raspberry sorbet will help you! All you need are frozen rapsberries and sugar (or stevia for a healthier option)! I wish I could say that we are experiencing Summer here in Gran Canaria, but, I would be lying. Truth be said, we´ve had a few nice, even hot days. Unfortunately that only lasts a few days at a time and then we´re back to the cold. The days range from cold to “perhaps it could be warmer today”. I´m tired of the cold. So over it! I want me some Summer-rrrrrr. This homemade raspberry sorbet is delicious! It´s made with frozen raspberries and sugar.. and a blender.. That´s it! I mean really! If I knew making frozen sorbet was as easy as that I would have started making my own a long time ago. My blender unfortunately is not the best so I needed to make it in two batches, but, if you have a heavy duty blender like this Kitchen Aid one you don´t have to split the ingredients in two. Perhaps if I´m a good girl and I behave well (what´s the hope of that happening) hubby will buy me one.. just maybe.. because my list of what I want is already very long *smile*. Freeze in a suitable container until it´s time to use. Let´s look at the health benefits of these powerful red berries. According to Nutrition and You raspberries are rich source of health promoting plant-derived nutrients, minerals, and vitamins that are essential for optimum health. Wow! Botanically, it is a small shrub belonging to the family Rosaceae, in the genus: Rubus. It grows very well under temperate climates. The berry is native to Europe but now widely cultivated in many temperate regions all over the world. Chief producers of raspberries are Poland, United States, Germany, and Chile. Raspberries are low in calories and saturated fats but are rich source of dietary fiber, and antioxidants. So now you know how to make easy raspberry sorbet, at home, ready at your disposal throughout the Summer. You can thank me later *wink*. A side note: I went shopping with my teenage daughter yesterday. Well actually the whole family went but hubby and Luca (5 years old) basically sat waiting outside the shops on a bench because they were bored! Luca always complains of tummy ache when we go shopping. Then, as soon as we get back into the car he is perfectly fine! Men! You gotta love them *smile*. I stocked-up on some “must have” t-shirts and bought a really cool statement necklace. I can´t wait to wear it! I don´t know about you guys but I´m loving the Bohemian look that has been brought back this Summer! It´s so pretty! Do you agree? 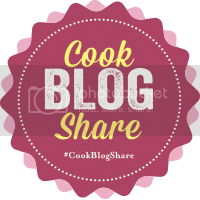 This post is linked up at the Cook Blog Share link up! Thank you to Super Golden Bakes and Patisserie Makes Perfect! This looks like a fabulously easy and delicious raspberry sorbet to try out – thanks for sharing the recipe! I’ll definitely be treating myself to some of these at the weekend! Can’t believe how simple they are to make! This looks like it would be super sweet and rich. I love it! Thanks for linking up with Delicious Dishes Recipe Party! Thanks Michele, I hope you do make it! The best part: it´s so easy! Yeah, this is getting pinned. It looks so refreshing and tasty! Also, I love that: “I just went shopping and got something really cool I can’t wait to wear” feeling. Thank you for sharing with us at the #HomemattersParty this week! lovely! I love raspberries and this looks delicious for hot summer days! Yes Please!! This looks amazing! Pinning to our #mondayfundayparty Pinterest board! Thanks for sharing! Delicious and refreshing! I am going to have to make this for my whole family this summer! This looks like the very taste of summer and so unbelievably simple. The stash of frozen raspberries in the freezer are calling me, I expect they’ll be pulverised before they know it! Looks lovely! Wonder if I can get my son to back off the raspberries long enough to make it. I’m sure he’d love it frozen as much as he loves them straight from the container. Visiting from Treasure Box Tuesday! Sending some AZ sun your way! Your sorbet looks delicious with it’s gorgeous color! Beautiful! Would love for you to add this to my Ice Cream Social going on over at my blog! Hope you can join us! Have a great week! Popping over from Monday Motivation =) Looks delicious and easy! Pinned for later. I am obsessed with raspberries and love eating them with anything. This simple sorbet is perfect for hot summer days! Me too! If I have to choose between raspberries and strawberries, raspberry always wins! That looks so good that I wish I could eat it off my screen! Surely will be pinning this one! I love how this is so perfectly easy! I have a kitchen Aid that I never use because I thought everything I would make with it would be too complicated. This is awesome – I’ll pull it out this weekend! I’m stopping over from the mom’s blog party. This looks delicious and so easy! I hope summer heads your way soon! I love simple sorbets like this. Great color too. Thanks Laura! The color is great isn´t it? I just love raspberries! Ooh. This looks like a refreshing sorbet. I’d love to share this dessert with my mom. She’s trying to cut back on refined sugars, so adding stevia to this is a great idea. Thank you for sharing :)! Thanks for your comment Erin! I hope your Mom loves it as much as I do. Definitely use liquid Stevia as it will blend easier. Johlene, I love this homemade raspberry sorbet!!!! so beautiful!!! and hoping the sun, warmth and summer gets to you soon! !